This article is a little dated, I suggest you read my more recent posts in the SEO archive of my blog. A lot of what I said below is probably still true, but social media plays a larger part in search engine optimization than it did in 2005. Alas despite this warning someone, probably someone working in search engine optimization wrote me asking me to change an almost thirteen year old webpage to link from an old article to a new article they had just written, obviously to improve their search engine optimization as old webpages have a higher trust factor, as this webpage has been in Google's index for over a decade and Google definitely kicks webpages and websites out of their index who engage in SEO shenanigans. Having uploaded my search engine optimization advice to my webserver on June 19th 2005 I felt both an obligation and a curiosity to see just how that page and other pages I had put up recently actually performed. 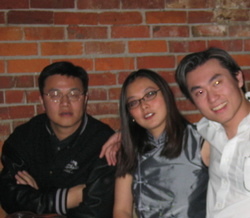 As I am currently an MBA student at the Sauder School of Business, the most recent additions to my webpage consisted primarily of pictures and stories about me and my classmates. First among classmates on more than just this trivial webpage, Marlene is pictured twice in my MBA Gallery and twice during my ramblings on image search engine optimization. As a result of this my website has been number one in Google for Marlene Lau for some time. She used to be in an all female band back in Calgary called Honeyrocket which is another phrase that has appeared in my logs lately. I must have done a pretty good job using the Rule of Five and optimizing other onpage factors as I doubt I have any inbound links with the anchor text "Marlene Lau". Image searching, at least on Google, uses a different spider. This bot is less active and Google's image index is updated less frequently. So despite having at least four pictures of Marlene on my website none of them are currently (as of June 24th) indexed by Google. So as a further experiment I recroped and renamed mbaClassmates.jpg to frankMarleneAndGary.jpg to see which image will end up in Google's index first. 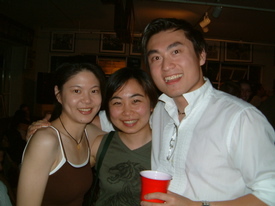 Gary pictured at right with Marlene and Frank Huang is another classmate who has been frequently mentioned recently on my webpage. Despite all these mentionings none of my webpages rank particularly highly for Gary Lau. As I mentioned previously, the fact that Lau does not appear in the title or body text on this page, contributes to why my website ranks higher for Marlene Lau. This page is an example of poorly chosen anchor text. Chinese surnames such as Lau are very popular. Since it appears it is easier to rank higher for Marlene than Gary Lau it can be inferred that Gary is a more popular first name than Marlene. I'm not sure whether Man Yee is more popular than Kayen. Man Yee and Kayen are Marlene and Gary's Chinese first names respectively. Thank goodness their last name isn't Zhang, that is the most popular Chinese last name. These searches were performed without using quotation marks. 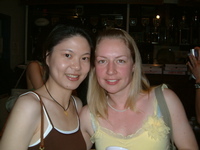 Anni Cao is another Chinese classmate whose name and picture appear on my website. Unlike Tracy and despite her name not being in the title nor the H1 tag I managed to easily rank first in Google for the phrase Anni Cao. This is because there are approximately 260,000 less pages in Google with the words "Anni" and "Cao" than the words "Tracy" and "Yang". Andrew Kuo also came to my house for Thanksgiving but his name is more popular in Google than Anni Cao so my story doesn't rank as highly for his name. Once again this shows that without the benefits of incoming links and keywords appearing in the title and H1 tag it is difficult to rank highly in Google. I have classmates other than the four mentioned above and some of them are even not Chinese. 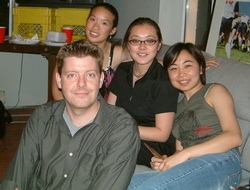 Pictured to the right is the inexplicably popular Ines Biedermann, which astute readers will recall is my most popular classmate in terms of search queries in June 2005, and the very sociable and highly photogenic Wendy Chang. Seeing how popular of a last name Chang/Zhang is, I don't hold out much hope of ranking highly for it. Chris Kerluke another non-Chinese classmate is an example of phrase for which my MBA photo gallery ranks first. Kerluke must not be a very popular last name as less than 500 pages were returned for Chris Kerluke in Google. In another picture, taken at an MBA event I was forced to miss due to personal problems, are Irene Leung, Josephine Man, and the omnipresent Wendy Chang. These three lovely ladies could have helped me, perhaps they still can, alas "nothing can be done." Irene is the holder of the unofficial title of best looking girl in our class. However I regret to inform all the single male websufers that she is married. I've even met her husband at the Core No More Party, he seemed like a nice enough fellow, I hardly talked to him though, I mostly talked to Marlene and Arman that night at Tonic. There are plenty of single intelligent Chinese women in my class if that's your thing. Another picture, this one contains: The Mighty Mighty Marlene Lau, the eminently electable Tracy Yang, and that dynamic Dane Sverre Panduro. One other mysterious person is pictured. See all the shiny happy MBA students, smiling, laughing at an MBA event. "Some are born to sweet delight. Some are born to endless night." Now we wait for the bots. One additional piece of advice for monitoring keywords in Google is to use Google Alerts. If you follow the latest advice on Googling your own name regularly, you could set up an Alert to do it for you. If you do use an Alert I recommend you use quotation marks to reduce false positives. Personal branding has become more and more important. As I'd prefer this page to not rank highly in Google as it is not part of my MBA Photo Gallery I'm only going to link to this from my search engine optimization page. Too much happened, ruining more than just my SEO expirements. If you really want to read the next post, I guess you can, it is still online in 2018.